Im happy to announce that the first version of my WordPress / Woocommerce plugin is finally finished and out there. The „Conversion Booster Tools“ comes packed with several features such as a wishlist, the ability to share shopping carts through different channels and a stock notification feature. Additionally its possible to create automated incentives on product pages that are designed to create a sense of urgency in the buying decision. Will there be new features and bug fixes? I plan on adding more features to this plugin in the coming months. Since the plugin was just released im pretty sure there will be a lot of little bugs that need to be addressed. I spent a pretty long time working out every possible problem before release but you never know how and in what ecosystem a plugin gets used. A more detailed roadmap with more information about upcoming features will be posted at a later date. I bought the plugin, where do i get support? Im currently working on a support system that will make this process straight forward. In the meantime you can reach me directly at support@themepresse.com Please provide your Envato license number with each support request so i can verify your purchase. Also please try to give a detailed descriptions of the problem and if possible an error message. You can also send me feature requests or any other kind of suggestion. 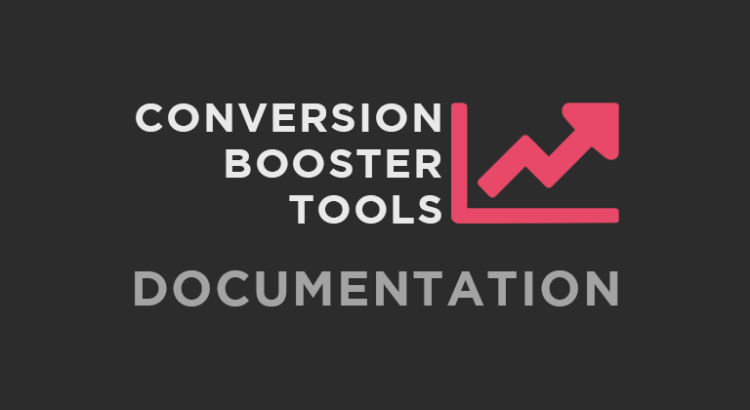 There is also a documentation for the Conversion Booster Tools Plugin. The docs cover usage and functionality and also include several tips and a constantly growing FAQ. Thats it for now. Thank you.